The leaders from China's parliament and advisory body said on Monday that China will boost friendly cooperation with Madagascar, with the African country reiterating its adherence to the one-China policy. "Taiwan is one part of China and Madagascar expects an early realization of peaceful reunification of China," said visiting Madagascan Senate President Guy Rajiemison Rakotomaharo. Rajiemison with his senate delegation started his China trip last Thursday at the invitation of Jia Qinglin, chairman of the National Committee of the Chinese People's Political Consultative Conference (CPPCC). Rajiemison met with Jia Qinglin and Wu Bangguo, chairman of the National People's Congress (NPC) Standing Committee, respectively on Monday. Jia expressed China's appreciation for Madagascar's adherence to the one-China policy, saying the two countries, both as developing nations, are shouldering common goal of developing economy and improving people's lives. "To enhance cooperation and promote common development complies with the fundamental interests of both peoples," Jia said. The CPPCC will increase exchanges and cooperation with the Madagascan senate to benefit China-Madagascar relations, said Jia. 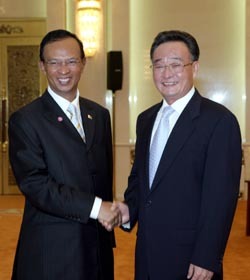 Wu Bangguo also expressed his thanks for Madagascar's support on Taiwan and human rights issues, pledging to facilitate parliament exchanges between the two countries and push forward bilateral cooperation and friendship to a new level. Wu spoke highly of China-Africa relations, saying China is ready to work closely with the African continent to boost China-Africa new strategic partnership. 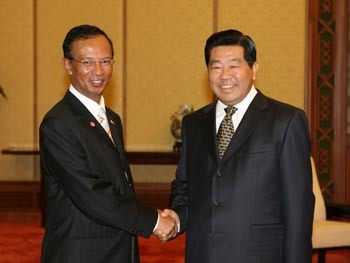 Rajiemison hoped Madagascar and China could further their cooperation in such fields as agriculture, tourism and energy.